"In our ‘sanctuary’, the sadness is settled. In our ‘sanctuary’, the joy is multiplied. " Yes! In our ‘sanctuary’, the sadness is settled, the joy is multiplied, and perhaps only when we come, stay, live, and feel, we pause just enough to be able to listen and understand the lyrics of the song. Especially, the days near the Mid-Autumn Festival of 2018, the joy of “Thien An Shelter” is filled with love from the philanthropists for the children. It can be said that the shelter was warmer and full of joy because, during Mid-Autumn Festival, the warmth of human love for childhood in general spreads throughout the world and, in particular for the children in Thiên Ân Shelter. Ms. Lê Dương Thể Hạnh - a person with a visually impaired disability, is always side by side with the visually impaired children at the shelter. Whenever Lê Dương Thể Hạnh has a chance to visit she give gifts to the children, and always earnestly conveys a meaningful message to the children. Her goal is to plant in the young heads of the visually impaired children a love message about love around them. She believes that the small and simple gifts that children received from her or the shelter’s sponsors, will allow the children feel the love of society for themselves and then they will have the motivation and belief to try. Ms. Lê Dương Thể Hạnh has developed great faith to overcome her own destiny and she wants to convey that strong belief and positive lifestyle to children specifically and to everyone in general. She wants to sow seeds and patiently wait for the seeds to grow and produce sweet fruit. Additionally, on the close dates of the recent Mid-Autumn Festival, our ‘sanctuary’ also received great love from groups and individuals who brought joy to children with presents and spiritual meaning. 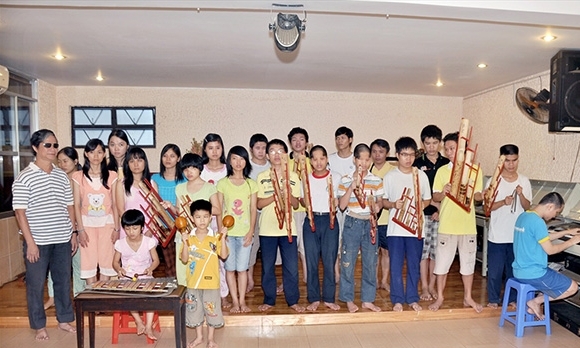 At the same time, with the enthusiasm to give joy to children, volunteers also prepared entertainment and games so the children can fully enjoy the Mid-Autumn Festival this year. Yes! Together, we were be able to multiply the joy, and let the love grow on. With big hearts filled with love for our visually impaired children at Thiên Ân ‘sanctuary’, the Mid-Autumn Festival of 2018 became more joyful and it became more meaningful because of the warmth of the humanity, the caring, the sharing, and the support. May the love of people and the love of society for the children, be a great motivation for them, a help for them to increase the faith, give them the desire to live through the darkness, and to open the eyes of their soul to see life with the faith of love and hope. Thank God for being together. Thank God for tomorrow on the way of life, the eyes of the soul glow with love. And thank you for life, thank you for sharing love, and let the love grow on.